Claim your access to the program and copy your personal referral link from here, then share it with your friends and followers. The screen shot below shows how it will look in your settings once you've claimed your access. For every paid customer that signs up via your referral link you get $50 cash after they’ve been a customer for 3 months. It quickly adds up. Once you earn $200 we pay out your money. We will contact you to arrange payment by PayPal or bank transfer if you are in Europe. 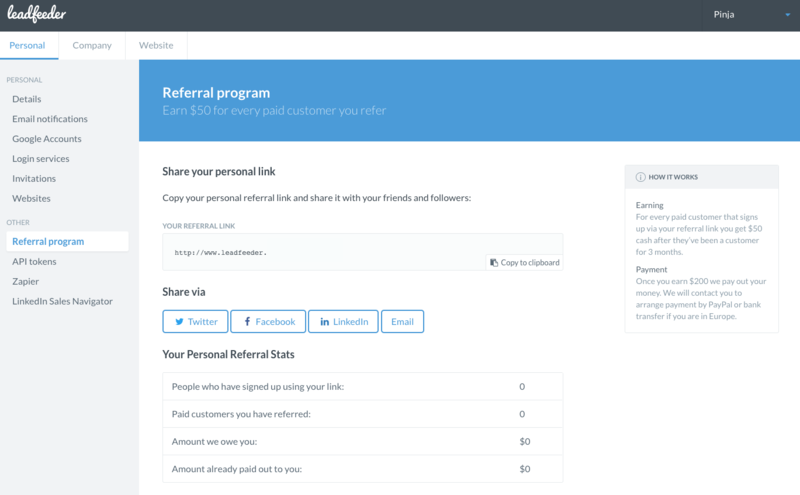 It's easy to tell people about Leadfeeder and start earning money from the Referral program page inside Leadfeeder. As you can see in the screen shot, we provide you with 4 sharing buttons. Sharing: when you click email we fill the message field for you in English and add a subject to the email. This screen shot shows you how it looks with one click.